Kantech’s innovative KT-1 single door controller is now available with embedded simplified access control software for one door systems, the ideal choice for those seeking a cost-effective, easy-to-use, single-door application. With KT-1’s Standalone Mode, using a dedicated web browser, the popular KT-1 Ethernet-ready single door controller now has the option to be controlled and managed via simple and intuitive web based software – no EntraPass software is required. This makes the KT-1 a viable option for small businesses and individuals with basic access control needs such as being able to assign card access and run reports. With no software to install, KT-1’s Standalone option broadens the horizon for dealers and installers as well. 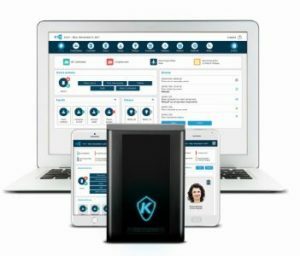 With a simplified and quick installation option, KT-1 Standalone is appealing to an installer base beyond the traditional access control installers who can forgo having to attend training to learn a new software system or receive special certification. The wizard-based platform walks installers through the process in minutes. Users with growing access control needs can easily migrate to the next level with Kantech EntraPass or hattrix software. The latest version of EntraPass Security Software launches with new features developed to streamline scheduling and account maintenance for operators. 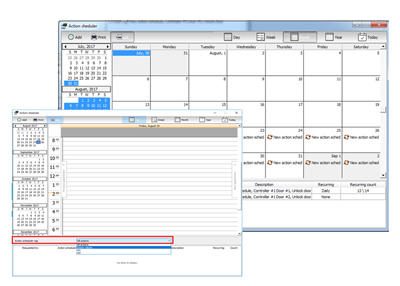 Available in EntraPass Corporate and Global Editions, operators managing premise access control can add to security capabilities by creating actions and tasks on a daily, weekly or monthly basis with the new Action Scheduler under the Operation menu. The Action Scheduler is ideal for locations where meetings can happen at sporadic times such as town halls or other types of special events. The actions are based on the door and relay behaviors such as locking and unlocking doors, arming alarm systems and toggling relays. Users can customize actions completely by combining Action Scheduler with the powerful Smartlink Task option. EntraPass can now intuitively automatically deactivate operators that have not logged in for a pre-determined amount of days, allowing for easier account maintenance with the Operator Auto-Deactivate feature. The latest version of EntraPass software integrates with American Dynamics Video Edge version 5.1 and now supports exacqVision version 9.0.2, bringing added control for premise security and management. In addition, administrators who also use Kantech’s hattrix, a cloud-based access control solution utilizing EntraPass security management software, can now more easily manage account service types and view and change account statuses with color coding for easy viewing. ioSmart Smart Card Readers and Cards provide a cost-effective migration from proximity cards to advanced smart card technology. The ioSmart family provides enhanced security through end-to-end AES-128 encryption over RS-485 when used with Kantech’s KT-1 or newer KT-400 door controllers but can also be used with any other access controllers using Wiegand protocol. 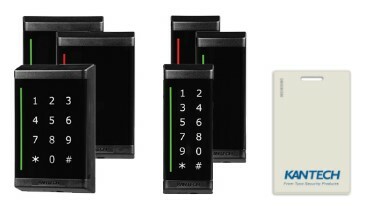 The readers offer an optional capacitive touch backlit keypad for enhanced security, illuminated keypad brightness and adjustable color programmable LED bar giving the ioSmart card readers an ecofriendly and esthetically pleasing design. ioSmart card readers are field firmware upgradable and have BLE hardware included, making them future proof. With both Mullion and Single Gang mounting options available, ioSmart card readers will fit any indoor or outdoor application globally. The new readers and cards are also now available in several Starter and Expansion kits. The RS-485 configuration connected to the Kantech controllers provides additional inputs and outputs such as door contact, Request-to-Exit and/or lock output saving considerably on wiring and labor costs. The ioSmart family supports ioSmart SSF MIFARE Plus EV1 encrypted cards in addition to MIFARE Plus ISO/IEC 14443A and 14443B card serial numbers. Other supported formats include Kantech’s ioProx (XSF) and HID Prox 125KHz (Kantech Secure Format KSF, standard 32-bit format, standard 26-bit format and Corporate 1000). Introducing the latest version of the Kantech EntraPass Security Software with support for Kantech’s ioSmart Card Readers and Cards, as part of an end-to-end encrypted access control solution. EntraPass v7.30 also includes integration with HID Mobile Access® for quick and easy access to doors using a mobile phone while maintaining management of credentials through EntraPass. Along with the newly added support for the ioSmart Smart Card Readers and Cards, EntraPass v7.30 will continue to support the ioProx Card Readers and Credentials. With the mult-technology options available on ioSmart Readers, the migration from Proximity cards to smart cards is easy with Kantech. EntraPass v7.30 now supports HID Mobile Access credentialing. The integration makes it possible for users to gain access to a facility using a credential on their smartphone from a BLE-enabled HID reader. The user receives an invitation from security personnel on their smartphone and can quickly download the credential. All credentialing is managed through the EntraPass Corporate and EntraPass Global Edition software. This latest edition of EntraPass software offers several enhancements to the EntraPass Go, EntraPass Go Pass and EntraPass Install apps. Added to EntraPass Go, which allows remote use of the software, is a link to “auto populated fields” that assists operators by bypassing the need to filling out configuration details to start using the app. EntraPass Go Pass, the mobile credential feature, now works with Android as well as iOS devices (including Apple Watch) and supports widget use, so users can unlock doors from a widget rather than having to open an app. EntraPass Go Install has been updated with a reader driver list and the ability to switch accounts without having to log in and out. There is also a new tutorial for EntraPass Go Install with additional user information. EntraPass v7.30 is available on Special, Corporate, and Global Editions as well as hattrix. C•CURE 9000 security and event management system now integrates with the Innometriks High Assurance Security Solution, a FICAM approved software, for strong identity authentication. The integrated solution includes FICAM (Federal Identity, Credential, and Access Management) software, Cheetah and Rhino Smart Card Readers and ID Server for FICAM continuous vetting. The C•CURE 9000 integration with the Innometriks FICAM software provides users with a seamless, high-assurance access control solution, which is important for government agencies that need to deploy a secure and interoperable access control solution for high security areas. Strong authentication verifies an individual’s identity using technologies including biometrics, smartcards, Public Key Infrastructure (PKI) and digital signatures to provide a level of assurance above and beyond that available through non-smartcard ID card mechanisms. With Innometriks’ FICAM software as part of the physical access control system, integrators benefit from installing an already integrated solution through reduced installation time and implementation complexities. End users will see faster transaction times and a reduced overall cost of the system when compared with systems that take a bolt on approach. Innometriks FICAM software is built on an open architecture platform. It integrates with many third-party readers and supports Open Supervised Device Protocol (OSDP) authentication. OSDP is a communications protocol that enables peripheral devices such as card readers and biometric readers to interface with physical access control system panels. OSDP provides another layer of sophistication through directional communication and read/write capabilities. Software House C•CURE 9000 now includes an end-to-end approach, providing the security market with a solution that includes card registration capabilities, validation and integration with HSPD-12 (Homeland Security Presidential Directive) complaint readers. Visit our website to learn more about Innometriks High Assurance Security Solution.